The Thule OutRide allows you to transport a bike with the stability of the professionals. It has adjustments to fit most bicycles, both with and without disc brakes. 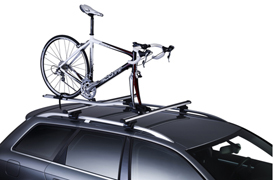 This roof mounted bike carrier mounts on roof bars (available separately) holding the bike upright. Rear wheel is secured to base. Front forks are clamped in an lockable quick release mechanism. The 561 outrider is not suitable for 100% carbon forks, but is suitable for carbon forks with alloy, wheel mounting points. Fits onto standard and aero roof bars. Double lock function that locks the bike both to the rail and to the load carrier. Adjustable wheel retaining straps for different tyre sizes.